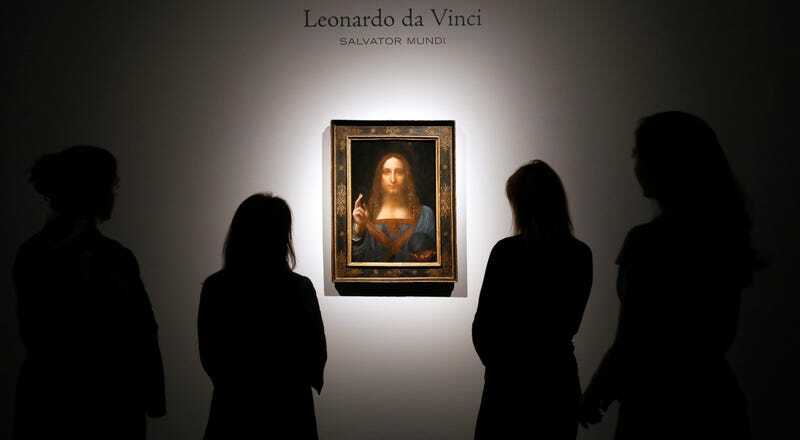 The Times reports that the work bid so generously upon was Da Vinci’s “Salvator Mundi,” substantially beating out the second-highest-priced piece of art sold at auction, Picasso’s “Women of Algiers,” which was bought in 2015 (Christie’s sold both works). The painting’s new owner has not been identified. It’s the kind of declaration that reminds one how technically the fall of the Berlin Wall, and the people who hugged for the most amount of time are both “historic.” So is this ridiculous art-money stunt. The painting is reportedly known to some as “the male Mona Lisa,” which doesn’t help matters. The only explanation that would justify it, in my eyes, is if there’s a billion dollars hidden in that painting. I’m especially hoping for this outcome, because, as the Times reports, “Some art experts pointed to the painting’s damaged condition and questionable authenticity.” Sorry, I don’t want to blow the lid off this whole international-art-crime-network intrigue, but, for real, someone check that painting for diamonds. Additionally, I’d like to take this opportunity to blame Dan Brown.